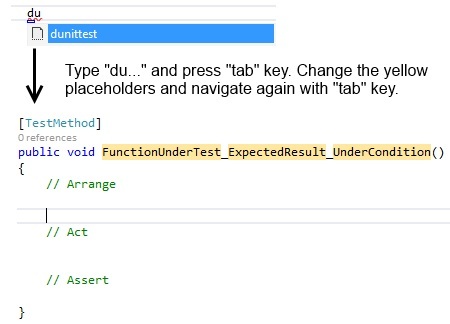 The method name is separated in three parts: “FunctionUnderTest”_”ExpectedResult”_”UnderWhichCondition”. And the unit test logic is build based on the AAA (Arrange,Act,Assert) pattern. You can import the snippet file through the “Code Snippet Manager” under “Tools”.